Rod Length: 37-1/2" 47-1/2" 53-1/2" 59-1/2" 62-1/2" 71-1/2"
Standard 1" diam. 20 gauge polished stainless steel curtain rod. 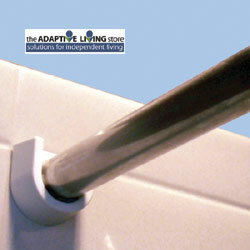 Spring-loaded mounting brackets designed for secure hold and instant removal of the curtain and rod.